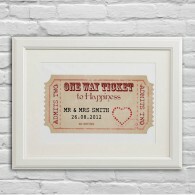 Ticket to Happiness - what more could you wish the happy couple. 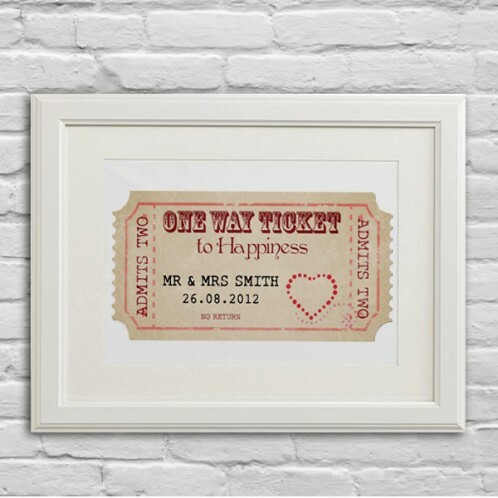 A most unusual, special wedding present that they will treasure. Personalised Wedding gift art print Ticket to Happiness - what more could you wish the happy couple. A most unusual, special wedding present that they will treasure. Printed on textured woodstock 300gsm art card, UNFRAMED, but will fit in standard size frames, either 8x10", or 12x16" or on a mounted canvas art print or Framed 9x11" print.